As an Interior Designer I like to do things a little different around my house. My homely style is a combination of Hampton’s, Rustic, Farmhouse, French Provincial and Industrial. It sounds like a lot of styles all rolled into one, but for me a home needs to reflect who you are, and doesn’t have to follow a certain style or trend 100% of the time. I’ve always loved the lime washed floorboard look, so 2 years ago, just before we had a 2 week vacation, we sanded back our floorboards and took to them with a combination of liming powder and water. Now, you may think I’m crazy for not just using an “all in one” liming sealer, but I’d seen this effect on other floors and rather than whitening the grain it just looked like a cloudy sealer was placed over the timber. I really didn’t want that look. So, we mixed lime powder with water, mopped it on the floor, wiped it off, let it dry, and then a professional sealed the floors for us while we were away. When we returned we thought it was absolutely fabulous! But after 6 months the sealer started to peal and the floors looked terrible. Two years later I had had enough! 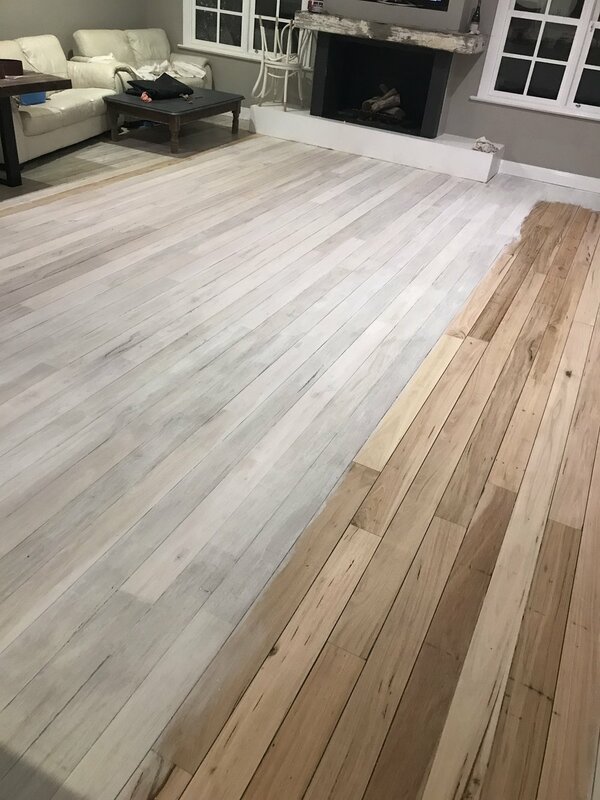 I researched white washing floors for hours on end, trying to find an easy solution that was going to last (without using an “all in one” product). There is really very little information on whitewashing floor boards on the net, or at least I couldn’t find much. I came across a simple blog post where the renovator watered down primer and rubbed it into the boards, and then just finished with a sealer. This seemed easy enough for me, so that’s exactly what we did. I spent a day on the floor sander bringing our Wormy Chestnut boards back to their former glory. Then watered down (2:1) water based white primer, and rubbed in into the wood, 2 boards at a time. It was a big job, my knees and back ached, but this was the finished whitening product. We did 3 top coats of water based clear sealer (we had to use water based as we were living in the house and have 2 year old twins). It seems to be holding up really well (2 weeks later lol). I will write another blog in 2 years time to let you all know whether it has lasted or if we have cut our losses and burnt the house down.